Sunderland earned only their third away league point of the season following an uninspiring draw against fellow strugglers West Ham at Upton Park. 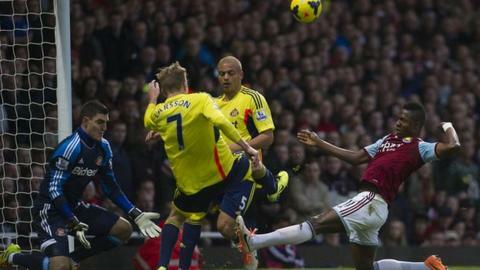 Jozy Altidore was through on the Hammers' goal early on but had his shot saved by keeper Jussi Jaaskelainen. A 25-yard shot from Black Cats defender Phil Bardsley came off the crossbar before Jaaskelainen fended away a long-range Lee Cattermole effort. Jaaskelainen also did well to keep out a late Ki Sung-Yueng shot. Sunderland remain bottom of the Premier League and five points off safety but they might rue a missed opportunity at not getting their first away league win of the season against a struggling West Ham. In an interview with Football Focus before the game, Hammers co-owner David Sullivan described the rest of the season as 'damage limitation' exercise with the Upton Park club hovering perilously above the relegation zone. West Ham have not been helped by winger Stewart Downing joining striker Andy Carroll and centre-back Winston Reid on the injury list, while they took on Sunderland without suspended captain Kevin Nolan. However, despite having the better of the game, Sunderland lacked the goalscoring touch to take advantage of a weakened West Ham, who have four points from the last 24 available. The Black Cats had an early chance through striker Altidore, who appeared offside, but the American had his angled strike saved by the slightest of touches from Jaaskelainen. West Ham's threat was fleeting, but Guy Demel thought he had scored when his header came back off a defender and he fired in the rebound, although referee Andre Marriner had already blown for a push by the Hammers right-back. There was plenty of effort from both camps, but it was the visitors who were producing the neater football and creating the more clear-cut chances. A free-kick from Hammers centre-back James Collins struck the jumping Altidore and inadvertently released Fabio Borini, who ran at the home goal before striking a poor shot which was straight at Jaaskelainen. Jaaskelainen was beaten when he failed to reach a powerful 25-yard strike by Sunderland left-back Bardsley but the crossbar came to the Finnish keeper's rescue. The Hammers stopper also had to fend away a well-struck long-range effort from Lee Cattermole just before the break. While there was little goalmouth action in the second half, Ki went close when he sidestepped to the left and struck a shot which Jaaskelainen did well to get a hand to and palm away. At the other end, George McCartney's late cross turned into a shot which Sunderland keeper Vito Mannone had to tip over, before Collins headed the resulting corner wide. See a photo gallery of all the action from Saturday's Premier League matches on the BBC Sport Facebook site. "We have got eight clean sheets so far this season. That is a brilliant return as we only got 11 last season. "We all know that the [scoring] goal factor that has not made the difference for us and had that been better we would be higher up the league. "The only thing that we are not doing consistently, at the moment, is scoring goals and that is why we are where we are." "Today is probably one of few games this season that I can say we deserved to win. "There are moments in the game when you have to take your chances, especially in the first half when we really on top of the game. "I need to look at performance, what we have worked on in the last two months and how good the team is playing. "I would like to go into every game with this feeling that I am going to see my team on the pitch. Match ends, West Ham United 0, Sunderland 0. Second Half ends, West Ham United 0, Sunderland 0. Ki Sung-Yueng (Sunderland) wins a free kick in the defensive half. Foul by Jack Collison (West Ham United). Attempt missed. James Collins (West Ham United) header from the centre of the box is close, but misses to the left. Assisted by Mark Noble with a cross following a corner. Corner, West Ham United. Conceded by Vito Mannone. Attempt missed. Carlton Cole (West Ham United) header from very close range is close, but misses to the left. Assisted by Joey O'Brien. Ondrej Celustka (Sunderland) wins a free kick in the defensive half. Foul by Carlton Cole (West Ham United). Attempt missed. Ravel Morrison (West Ham United) right footed shot from outside the box misses to the left. Assisted by Carlton Cole. Lee Cattermole (Sunderland) wins a free kick in the defensive half. Offside, Sunderland. Lee Cattermole tries a through ball, but Steven Fletcher is caught offside. Substitution, Sunderland. Andrea Dossena replaces Phillip Bardsley because of an injury. Delay in match Phillip Bardsley (Sunderland) because of an injury. Attempt saved. Ki Sung-Yueng (Sunderland) left footed shot from the left side of the box is saved in the top centre of the goal. Assisted by Emanuele Giaccherini. Attempt missed. Phillip Bardsley (Sunderland) right footed shot from outside the box misses to the right. Assisted by Ki Sung-Yueng. Substitution, West Ham United. Carlton Cole replaces Joe Cole. Attempt saved. Mohamed Diamé (West Ham United) right footed shot from the left side of the box is saved in the centre of the goal. Sebastian Larsson (Sunderland) wins a free kick in the defensive half. Foul by Ravel Morrison (West Ham United). Substitution, Sunderland. Steven Fletcher replaces Jozy Altidore. Substitution, Sunderland. Adam Johnson replaces Fabio Borini. Attempt missed. Jack Collison (West Ham United) right footed shot from outside the box misses to the left. Assisted by Modibo Maiga. Foul by Jozy Altidore (Sunderland). Jack Collison (West Ham United) wins a free kick in the defensive half. Foul by Sebastian Larsson (Sunderland). Ravel Morrison (West Ham United) wins a free kick in the attacking half. Attempt saved. Jozy Altidore (Sunderland) right footed shot from outside the box is saved in the centre of the goal. Assisted by Emanuele Giaccherini. Attempt missed. Emanuele Giaccherini (Sunderland) right footed shot from outside the box is high and wide to the right. Assisted by Fabio Borini. Substitution, West Ham United. Joey O'Brien replaces Guy Demel. Attempt missed. Sebastian Larsson (Sunderland) right footed shot from outside the box misses to the right. Assisted by Emanuele Giaccherini. Attempt missed. Mohamed Diamé (West Ham United) right footed shot from the right side of the box is close, but misses to the right. Assisted by Mark Noble. Substitution, West Ham United. Jack Collison replaces Matthew Jarvis. Attempt saved. Ravel Morrison (West Ham United) right footed shot from outside the box is saved in the bottom left corner. Assisted by George McCartney. Attempt blocked. Emanuele Giaccherini (Sunderland) right footed shot from the left side of the box is blocked. Assisted by Sebastian Larsson. Corner, Sunderland. Conceded by Guy Demel. Attempt blocked. Jozy Altidore (Sunderland) right footed shot from outside the box is blocked. Assisted by Ki Sung-Yueng. Second Half begins West Ham United 0, Sunderland 0.